In the event that something goes wrong with Voxel8 printer, the following section will help you remedy certain known predicaments. If you encounter an issue with your printer that is not listed below; please contact us via the live chat on the support.voxel8.co website, or submit a support ticket so that we can help you resolve your issue. The following are some common hardware issues you may encounter when operating the Voxel8 Developer's Kit printer and how to resolve them. My build plate has ripped blue tape and it's causing issues. My Voxel8 Printer won't jog to a new build plate position when I use the direction keys in the Control Interface. Large Plastic deposit is attached to the FFF nozzle. Filament breaks off in feeding tube. Silver has dried and is clogging the nozzle tip, or silver tip has accidentally been bent. My laser alignment process always aborts with an error message? What is going on? Plastic prints do not stick well to the build plate, or prints do not stick at all. Print is stuck to the build plate. Not enough thermoplastic is dispensed. Not enough silver is dispensed. Material flow is stopped and being ground by the filament feeder causing a "clicking" noise at the top of the print head. Machine makes rattling noises during operation. The FFF extruder nozzle is dragging on printed objects. The Voxel8 Control Interface does not respond to commands. The alignment process keeps failing. What am I doing wrong? How do I fix it? I am having issues activating my Voxel8 Printer on my network. Common issues for Print Failures. The first layer of plastic in my print does not adhere to build plate. I am getting hersey kiss like structures in my silver trace? How do I address this? Weak printed parts, or delimination. Removing the old tape from the build plate and reapplying a fresh new, level piece of tape is best in this situation. Your shipping box contains a package of 20. For information on how to apply them, check out the walkthrough. See Picture 000: New build tape square. You must first click the home button to enable manually jogging through the Control Interface (see Picture 001). Once you have done that, you should be able to manually jog the print head around the build plate. Picture 001: Clicking the home button on the Voxel8 Control Interface enables the jogging mechanism. If you run into a situation when a large amount of thermoplastic is attached to the end of the nozzle, you will need to fix this before printing. To do this follow the steps below. WARNING: YOU SHOULD NOT TOUCH THE EXTRUDER HOT-END DURING THIS PROCEDURE -AT ANY POINT- AS IT IS HEATED. 1. Heat the FFF extruder by using the Control Interface and hitting the "Set" button (see Picture 002). Picture 002: Clicking the home button on the Voxel8 Control Interface enables the jogging mechanism. 2. Wait till the extruder heats up to it's melting point (e.g. PLA is approximately 200 ºC) as pictured in the Voxel8 Control Interface (see Picture 003). Picture 003: The hot-end is now up to temperature. 3. Once the extruder is heated, the plastic deposit will likely start to drop from the nozzle end (see Picture 004). Picture 004: The plastic debris has melted on the extruder tip. 4. At this point, carefully remove the plastic from the nozzle tip using tweezers, or something other than your hand onto the build plate below (see Picture 005). You want to remove as much excess material as possible from the tip of the extruder nozzle. Picture 005: The plastic debris on the build plate. 5. Clean and dispose of the plastic debris that was deposited on the build plate (see Picture 006a & 006b). For PLA and ABS that do not contain any silver, you can dispose of plastic through normal recycling means. Picture 006a: Cured silver on build tape. Picture 006b: Cured silver on build tape (close up). In certain environmental conditions, some thermoplastic has tendency to retain or expel water. Once you open a package of filament from its plastic bag it can become more brittle over an extended amount of time. If your filament breaks off during printing you may need to remove pieces from the extruder and the guide tube that runs the length of the back of the machine. If you filament breaks, it's important to stop any active print job as to prevent any kind of extruder jam which is more challenging to fix. We recommend pausing the print if you notice any breaks from the spool while you diagnosis the problem. 1. Pause or stop the machine prior to fixing the problem to stop the machine progressing into a possible extruder jam situation (see Picture 007 or Picture 008). Picture 007: Pausing the printer via the touch panel. Picture 008: Pausing the printer via Control Interface. 2. Identify the break(s) points in the filament. Picture 009: The filament has broken inside of the guide tube and must be fixed. 4. Remove the guide tube from the FFF Extruder, and set aside, while still attached to the printer at the rear. 5. Remove the filament following the instructions in our Unloading Filament Guide. 6. Upon unloading, reinsert the filament within the guide tube, and follow our Loading Filament Guide. It is important to inspect every red nozzle that is attached to the Voxel8 syringe barrel cartridges. We recommend you use a new nozzle for every print job, as any dried silver can cause failed prints or other issues. Common examples are unclean nozzles (see Picture 010a) and slightly damaged tips (see Picture 010b). Picture 010a: A red nozzle tip that was not getting enough wiping solvent, and will cause silver print errors. Picture 010b: A red nozzle tip that is slightly damaged at the end point. Hold the nozzle up to the light if you have trouble seeing if a syringe has dried silver clogged the end point (see Picture 011), otherwise it is likely viable to use for printing (see Picture 012). Picture 011: Bad Nozzle: No light is shining through the end point at the bottom. It is likely clogged with cured silver. Picture 012: Good Nozzle tip: Light is visible at the nozzle tip so it should be viable for use (as long as it is not bent). My nozzle was been damaged and is bent or warped. What should I do? If the nozzle appears to be bent or warped (see Picture 013) you should dispose of it and use a brand new nozzle from the box supplied to you from Voxel8. NOTE: Using a suspect used nozzle may cause printer failures, so avoid it all costs. It's always better to use a new nozzle. 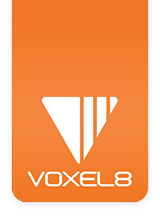 If you require more nozzle tips, you can purchase them from Voxel8 at the following address: http://store.voxel8.co. Picture 013: Red Nozzle is obviously bent, perhaps due to a collision with a printed part or other object. Do not touch the machine or get in the way of the laser profilometer during the bed leveling and silver alignment process (see Picture 014). Any slight vibration, or physical touch might throw off the calibration of the machine. Picture 014: Laser Distance Ranger Finder being interfered with. Before the laser alignment process, it's best to close the clear acrylic Voxel8 Printer cover (see Picture 015), so that it is not possible to get in the way of the alignment process and the laser as it does its distance scanning of the printer bed area. Picture 015: Voxel8 Developer's Kit Printer with closed cover. Be sure to remove all debris from the back of the bed area (see Picture 016) as this is used during the laser ranging process. Any debris will throw off the alignment and the alignment script will fail (see Picture 017). Picture 016: The Voxel8 printing area has been cleaned of debris and most tools. Picture 017: Error Screen that displays when the Alignment procedure fails. If you are having issues getting parts to adhere to the build plate, you should check the following. Are you using the supplied blue tape applied to the surface of your aluminum build plate (see Picture 018)? Picture 018: Blue tape on the Voxel8 build plate. Do you have blue tape applied to your build plate? Is it deteriorated and/or worn in areas (see Picture 019A & B)? A = rips, B = very worn and lacks adhesion. Picture 019 A & B: An (older generation) build plate has torn or worn areas which are problematic for printing. Are you using a 3rd party adhesive layer (see Picture 020) on the build plate (e.g. Buildtak)? Have you read their documentation on application and usage? Have you contacted that vendor? Picture 020: (Older generation) Build plate has BuildTak (tm) applied to it instead of blue tape. Have you recently leveled your build plate (see Picture 021) using the Voxel8 Control Interface? Picture 021: Build plate leveling. Have you properly selected the right thermoplastic material you are working with (see Picture 022a)? And supplied the right melting temperature in the Voxel8 Control Interface? In Picture 022, we have selected the PLA presets for printing standard Voxel8 provided thermoplastic filament. Picture 022a: Thermoplastic material selection in the Voxel8 Control Interface. Are you using ABS? Are you heating the build plate in the Voxel8 Control Interface? Verify that the build plate is heated in the Temperature panel (see Picture 023b) found in the Voxel8 Control Interface, or look on the front panel interface for the information. Picture 023b: Heated build plate toggle in Voxel8 Control Interface. Are you using Voxel8 supplied filament (see Picture 024a), or a 3rd party vendor (see Picture 024b)? If the latter, you could possibly to try to print the thermoplastic on another machine to verify if the material is source of the problem. Picture 024a: The Voxel8 supplied thermoplastic filament (0.75kg spool of 1.75mm PLA). Picture 024b: A 3rd Party vendor supplied thermoplastic filament (1kg spool of 1.75mm). Not recommended for printing. CAUTION: Be careful when removing parts from the build plate using sharp tools such as your putty knife. Removing parts by hand from the build plate is not recommended, since a.) you may damage your part and/or b.) you may mistakenly touch a heated build plate (if it is turned on). We recommend using the supplied metal spatula, or one that you supply from your own toolset. If a printed object is tough to remove from the build plate using your hand, use a metal spatula, or the included putty knife to help apply leverage between the blue painter's tape on top of the build plate and underneath the bottom of your 3D printed part. If your print has no electronic components in it and it is a small build then it is fine to carefully remove the part while the build plate is still attached to the bed area (see Picture 025). Picture 025: Removing a print from the build plate using a flat edge spatula. If your print does have electronic components in it, we recommend that you remove the build plate and place it on a flat, solid surface to help pry the part off the build plate (see Picture 026). Use one hand to hold the build plate, and the other with the tool to remove the print, applying very gentle side to side wiggle and pressure to work your way under the part before pushing it underneath more of the print. At a point you should be able to grab the part and carefully remove it by hand without the pry tool. Picture 026: Using the supplied putty knife to remove a print from an (older generation) Voxel8 build plate. Pro tip: If you have trouble removing the print from the build plate using the putty knife or metal spatula, then you might carefully use a razor blade to help pry underneath and pop the print off the build plate. 1. Check to make sure that thermoplastic filament is being feed into the Printer. 2. Also check to make sure that the correct melting temperature is set in the Voxel8 Control Interface for PLA, ABS, or other materials you might be using (see Picture 027). Picture 027: Check the material melting point and selection in the user interface. 3. Be sure to recheck the build plate for proper leveling (see Picture 028). Re-leveling the build plate ensures that the FFF extruder nozzles is neither too far, not too close during the thermoplastic dispensing process. Picture 028: Re-leveling the build plate. Sometimes prints can lack the correct amount of silver dispensed due to some common scenarios (see Picture 029). Common problems include: dirty nozzles (A), empty silver syringe (B), air pressure issue, or a possible failing pneumatic pump (C). Picture 029: Silver dispensing diagnostics custom image. You should first check the nozzle tip to make sure it is clear and free of debris or dried silver. Next you should remove and check your silver cartridge, to make sure you have material remaining in the chamber. Also check to make sure it is not dried out. Ensure that you are using the correct configuration for the conductive ink that is loaded in the machine. Check Dashboard to make sure that the print job was sliced with the configuration that matches the ink loaded. If both of these items are not the issue, then you should contact Customer Service and allow us to help you troubleshoot the issue. IMPORTANT NOTE: You should check out our article on Skipping and Stripping before you proceed further with diagnosis and attempt to troubleshoot. 1. Stop, or pause, any active print immediately, either through the front touch panel interface (see Picture 030), or through the Voxel8 Control Interface (see Picture 031). 2. Heat the extruder to the melting point of the thermoplastic (e.g. PLA =~ 200 C) if it is not already heated (see Picture 032). Picture 032: B. Heat the extruder to the correct melting point of material you are using( e.g. =~ 200 C for PLA). 3. Loosen the guide mount from the FFF extruder (see Picture 033) and make it so you can see the filament depress level on the top of the extruder. Picture 033: C. Loosen the top filament guide mount from the top of the extruder. 4. Once the temperature is at melting point, carefully depress the lever (see Picture 034) and then pull the filament up to remove it from the extruder head. Picture 034: D. Depress the top filament release lever. 6. Once you have the filament in hand, you should use one hand to pull the filament and the other hand to keep the spool from dispensing too much. You want to carefully examine how much friction is on the filament from the bay by pushing and pulling it (see Picture 035). Picture 035: E. Determine if the filament can freely spin. The Developer's Kit is makes squeaking noises. If the machine starts to make any squeaking noises it could be a sign that your Printer requires lubricant (see Picture 036). You should identify the location of the noise, first. The threaded z-axis rod (see Picture 037) is a legitimate area to lubricate if it is causing abnormal operating noise. Picture 036: Synthetic grease for z-axis. If the noise persists after lubricating your Developer's Kit printer, then you should contact Customer Support immediately so we can help. You should power off the machine as soon as possible and contact customer support. If the rattling is minimal, you should try to identify the source of the noise. Clear off all items from underneath the printer build plate, near the filament bin area. The printer should be free and clear of anything that could vibrate. Next, try to locate the area the rattling is coming from. If you can't easily identify the root cause, then Contact Support and let us know the location of the rattle so we can help you further diagnosis and fix the problem, before servicing the machine. This may indicate that the printer head is too low and that the bed is not properly leveled (see Picture 038). Picture 038: Previously printed objects are dragged. A.) check to make sure that the bed area is clean of silver and plastic debris. B. ) Check to ensure that the metal cantilevers are properly installed in left and right slots on the bed, underneath the build plate. Also make sure they are no longer taped down. Picture 039: Alignment process failing as reported from the touchscreen interface. If you are having issues getting your Voxel8 Printer activated through your network, you should make sure that the machine is plugged into an active ethernet port (see Picture 040), or that you have configured your WiFi connection correctly (see Setting up Network Configuration). You should test the connect without the printer with a normal computer plugged into your ethernet jack to help c the issue. Picture 040: Voxel8 Printer is plugged into an ethernet port. In the following screens, the Voxel8 printer is having issues connecting and displays a "half world" icon indicating failure to connect (see Picture 041). When the printer is connected correctly, it will display a full world icon in the top right corner of the front touch screen of the Voxel8 printer (see Picture 042). Picture 041: Voxel8 Printer is not connected to the network. Picture 042: Voxel8 Printer is connected correctly to a network (i.e. solid world icon). If problems persist, it could be a firewall preventing your machine from talking to the externally, and cloud based servers. You should contact your local IT administrator and make sure that port 80 is open and not blocked for HTTP web traffic. a.) need to re-calibrate and align the build plate (see Picture 043), b.) filament is not up to temperature (see Picture 044). Picture 043: Re-calibrating the build plate is needed. Picture 044: Filament is not up to correct temperature. The nozzle is too close or too far away and the bed needs to be re-leveling (see Picture 045 & 046). Adhesive layer needs to be replaced (see Picture 046). Picture 045: Nozzle is too close to build plate and plastic is not being dispensed. Picture 046: Build tape needs to be replaced. Nozzle may have been too close to build plate. I am getting hershey kiss like structures in my silver trace? How do I address this? During the printing process, your silver trace might exhibit more some cone like deposits at end points of the dispensing of material (see Picture 047). This is normal behavior, however if it becomes extreme then please contact Voxel8. Picture 047: "Hershey Kiss" effect on printed parts with silver trace. Sometimes the issue can be as simple as a improperly loaded filament or a skipping or stripping event with debris inside the FFF extruder. We do not recommend performing this, but there is the Cold Pull technique for FFF/FDM extruders. NOTE: We only recommend this technique ONLY if you are an experienced 3D Printer operator and have performed this technique before. Disassembling the extruder is not recommended. In the event that you cannot unblock your extruder, you can have to have it serviced by us. Please contact us and specify that you're having issues with your extruder and we will issue an RMA. During the printing process, a print may become delaminated from the build plate (see Picture 048). This can happen for a number of reasons. Some of the most common are: a.) worn build tape b.) incorrect temperature settings for the material printed c.) incorrect build plate alignment, d.) the build plate is not fully secured within its base. Picture 048: A printed part has become delaminated from the build plate. The following are some commonly known software issues you may encounter while operating the Voxel8 Developer's Kit Platform and how to resolve them. In the event you run into a software bug, please report it to the Voxel8 team so that we can fix the issue. Touch Panel is frozen or not responding. Reconnect error message within the touch panel. I've forgotten my account info. How do I recover my password for the Voxel8 dashboard? The touch panel is displaying an error that says "Webpage not available" and reloading it does not seem to fix the problem. What can I do? If the touch panel on the Voxel8 Printer becomes unresponsive, you should attempt to control the machine from the Voxel8 Control Interface. First you should try disconnecting and then reconnecting from the front panel (see Picture 049a). Picture 049a: Disconnecting the Printer. Secondly, you should try disconnecting and reconnecting a few times from the Control Interface (see Picture 049b). Picture 049b: Disconnecting and Reconnecting to the Printer from the touch screen. Lastly, if that fails, then you should power the cycle using the on/off button on the back of the machine as a last resort (see Picture 050). Picture 050: Printer is not responding to touch interface control. If the Voxel8 Control Interface stops responding, then you should attempt to disconnect and reconnect using the front panel display (see Picture 049b), or via OctoPrint (see Picture 051). If that fails, then you should resort to power cycling the machine from the on/off button on the back of the Printer. Picture 051: Disconnect the Voxel8 Printer using the Voxel8 Control Interface. Occasionally you will receive this error message (see Picture 052) on the Voxel8 Developer's Kit Front Panel display. You will need to click the "Reconnect" button when it occurs. You will need to disconnect and reconnect through the Voxel8 Control Interface (see Picture 053). You may need to do this a few times. Picture 053: Disconnecting and Reconnecting in the Voxel8 Control Interface. In the event you lose your password for the Voxel8 dashboard, you can recover it by going to the forget password page (see Picture 054), and sending it to the email address you used to register with. Picture 054: Forgot password page. 2. Enter in your email address and click the "Send Reset Instructions" button (see Picture 055). Picture 055: Submitting the "Forgot Password" page fields. 3. Click the "Change my password" link contained in the email sent to reset your password to something you will remember (see Picture 056). Picture 056: The password email confirmation. 1. First click on the reload link on the web page presented via the touch screen interface (see Picture 057). 2. If that does not fix the problem, then try power cycling the machine using the physical on/off switch on the back left of the Voxel8 printer. If you are still having trouble after performing both of these actions, please contact support. Picture 057: "Webpage not available" error screen displayed on the Voxel8 Developer's Kit touch display. The following are some common issues and resolutions involving materials (e.g. thermoplastic PLA or Voxel8 conductive silver ink provided with your Voxel8 Developer's Kit printer. I can't seem to print clear PET filament with the Voxel8 Printer. The following is a comparison of various z-heights for printed silver to help you troubleshoot your printer for optimal results using the alignment process (see Picture 058a-c). If the silver is ever too low (see Picture 058b) or too high (see Picture 058c), then you should run the alignment procedure again. Below is an example of a calibrated trace (see Picture 058a). Picture 058a: Optimal silver trace has been printed (A). Below is an example of a printed calibrated trace that is too high. Note the "wavy/ripple" effect in the trace, because the nozzle is too high during printing (see Picture 058b). Running alignment again is recommended. Picture 058b: Silver trace is too high (B). In Picture 058c, the silver trace might too low, and is causing the nozzle to flatten the trace. Running the alignment is needed. Picture 058c: Silver trace is too low and is producing a flatter trace (C). The following is a comparison of various z-heights for printed thermoplastic to help you calibrate your printer for optimal results using the alignment procedure (see Picture 059a-c). Below (see Picture 059a), we see a close to optimal printed trace. Alignment appears to be dialed in. Picture 059a: A close to optimal printed trace dispensed onto the plastic (A). In Picture 059b, we see the effects of printing silver too high, which consists of wavy/rippling effect within the trace. Running alignment again is recommended. Picture 059b: The plastic printed fine, but the silver trace is too high (i.e. wavy output) (B). In Picture 059c, we see an example of printing a bit too low with silver. Running alignment again is recommended. Picture 059c: The printed silver trace may be a bit low (C). I can't seem to print clear or very transparent filament with the Voxel8 Printer. This is a known issue and we're looking into it. Unfortunately at this time you must use a non-clear PET to print with the Voxel8 Developer's Kit Printer. Translucent or semi-opaque thermoplastic materials (see Picture 060) may cause issues with the laser profilometer. IMPORTANT NOTE: We recommend using the Voxel8 Printer filament. Using 3rd party thermoplastic may cause print failures. Picture 060: Translucent or semi-opaque filament.